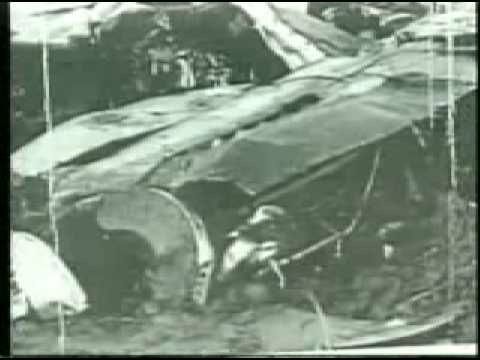 THE FIRST PILOT TO DIE CHASING A "UFO"
MOST "UFO'S" are rarely dangerous to humans, but if you shoot at them or pursue them, all bets are off. They will often defend themselves. There have been fatalities and abductions. There are hundreds of thousands, if not millions of people who have been abducted. Most of them do not remember what happened, unless they are taken under Hypnosis and brought back to that time in their memory. On this day in history, January 7, 1948, a very unusual occurance happened. Captain Thomas Mantell, Jr., and several other pilots were sent to investigate a round and very large flying object which had beed observed in the area of Madisonville Kentucky, USA. They were flying a USAF P-51 which was the fastest airlane at the time. The round aircraft were spotted by the Control Tower at Goodman Air Field at Ft. Knox Kentucky. On their direction the pilots set off towards the UFO. The object kept climbing, and the other pilots gave up the pursuit because of lack of Oxygen. Mantell continued the pursuit. During the pursuit, at 15,000 ft., Mantell reported back by radio: "The object is directly ahead and above me now, moving at about half my speed . . . it appears to be a metallic object or possibly the reflection of the Sun from a metallic object, and it is of tremendous size . . and I am still climbing. I am trying t close in for a better look". He climbed to 22,000 ft., which is the high end limit where a pilot can function properly without supplemental oxygen. BUT, he still kept climbing to 30,000 ft., where his plane leveled off. All the rumors and the denials by the Air Force was put to rest by a witness on the ground who saw the UFO and the airplane, and he said the airplane exploded. Richard T. Miller, who was in the Operations Rom at Scott Air Force Base at Bellewille in Illinois also made several profound statements regarding the crash. He was monitoring the radio communication between Mantell and Goodman Control Tower, and claims to have heard this statement very clearly: "My God, I see people in this thing". And that is supposed to have been the last words Captain Thomas Mantell said - - on the radio. You can make your own conclusions, but these are the official records and statements from people who saw and monitored the situation. And the picture show the P-51 after it crashed.